This is a recipe my mum and stepdad made one day. We were staying at their house and they said "there's some leftover meat in the fridge, help yourself" before going away for the night. We thought, ok, sounds good. We loved it SO much, we made it ourselves. Twice! The recipe can be found at ichef.com, but I'll transpose it here for ease of reference. The recipe is for a curried leg of lamb, marinated in spices for 24 hours and roasted for 2.5ish in the oven. I'd say it's not necessarily difficult, but it takes a while to do the preparatory work, and you may benefit from a bit of experience in working with meat, and in grinding spices. I really think it is in your interests to read the whole thing before embarking on this "journey" so that you have an idea of preparation time. If I have a picture on my home computer I'll upload it later. I hope you like messy cooking! 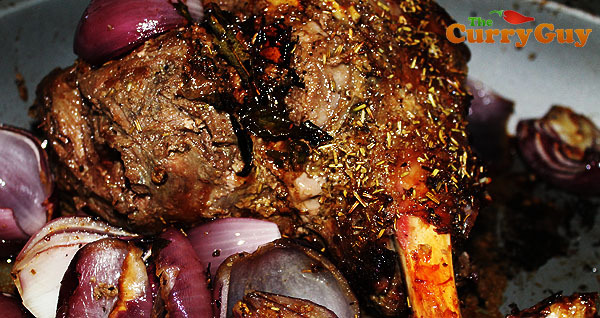 Before you start: if the lamb is vacuum packed, it smells less if you open it under water. 1. Make sure that all the fat has been trimmed from the outside of the leg and that most of the fell (parchment-like white skin) has been pulled off. NB This took me an hour the first time, and almost 3 hours the second time! I think it really depends on the lamb itself, and on your own thoroughness. Put the leg in a baking dish made, preferably, of pyrex or stainless steel. 2. Put the 2 oz. almonds, onions, garlic, ginger, green chillies, and 3 tablespoons of the yoghurt into the container of a food processor or blender and blend until you have a paste. Put the remaining yoghurt into a bowl. NB The first time I did this I didn't have access to a blender. Instead, I ground all of the spices with the end of a rolling pin in a dish and mixed them into the yoghurt. The onions, ginger and chilli were grated or chopped finely, and the garlic was pressed/minced. 3. Beat lightly with a fork or a whisk until it is smooth and creamy. Add the paste from the processor, the cumin, coriander, cayenne, salt and garam masala. 4. Mix. Push some of the spice paste into all the openings in the lamb. Be quite generous. (I forgot to say, you need to ask the butcher to make a deep pocket to hold a "stuffing", in this case, some spice paste mixture, or make a pocket yourself). NB I just cut some pretty deep slashes in the meat and fill them to the brim with this paste!There's also part of the meat that is generally "separate" to the rest, I tuck the paste behind this meat, too. Spread the paste evenly on the underside of the leg (the side that originally had less fat.) Now, using a small, sharp, pointed knife make deep slashes in the meat, and push in the spice paste with your fingers. 5. Turn the leg over so its outer side (the side that was once covered with fat) is on the top. Spread a very thick layer of paste over it. Again, make deep slashes with the knife and push the spice paste into the slashes. Pour all the remaining spice paste over and around the meat. Cover with plastic cling film and refrigerate for 24 hours. 6. Take the baking dish with the meat out of the refrigerator and let the meat come to room temperature. Remove the cling film. Heat the oil in a small frying pan over a medium flame. When hot, put in the cloves, cardamom, cinnamon and peppercorns. When the cloves swell - this takes just a few seconds - pour the hot oil and spices over the leg of lamb. (The spices jump and spit in the oil quite a lot - make sure your arms and counter are well protected). 7. Preheat the oven gas mark 6, 400 F. Cover the baking dish tightly either with its own lid or with a large piece of aluminium foil. Bake, covered, for 1 hour 30 minutes. Remove the foil and bake uncovered for 45 minutes. Baste 3-4 times with the sauce during this period. 8. Scatter, or arrange in a pattern, the sultanas and the 1/2 oz. almonds over the top of the leg and bake for another 5-6 minutes. 9. Remove the baking dish from the oven and let it sit in a warm place for 15 minutes. Take the leg out of the pan and set it on a warm platter. Spoon off all the fat from the top of the sauce. Use a slotted spoon and fish out all the whole spice in the sauce. Discard the spices. Pour the sauce around the leg. A fantastic meal for around 4 people, when you have a special occasion to celebrate. Serve as you like - we serve it with aromatic rice, but I think mashed potato would also work well.